The next time you catch a gorgeous sunset in Vancouver, stick around after the sun sinks below the horizon for a little scenic stargazing. If you can get away to somewhere with low light pollution, for example Tofino, Helmken Falls in Wells Grey National Park or almost any part of northern BC, you’re guaranteed perfect sky watching conditions. Is there anything that compares to millions of stars lighting up the night sky? To observe the solar system near Vancouver, you’ll need to scope out a spot with clear skies. Bundle up if you’re stargazing in fall or winter. No matter the season, it’s always more fun when you bring a thermos of hot cocoa, a blanket, and someone special. Bring a blanket and kick back on this long stretch of beach between UBC and Point Grey. There is parking in the area, and occasionally bonfires at night. Light pollution is worse the closer you are to the city, but if you can’t get out of downtown, you can still catch some twinkling lights. Take in the huge stretch of unobstructed sky from David Lam Park in Yaletown. It’s a particulary good place for seeing the full moon in all its glory. For astronomy keeners, the Gordon Southam Observatory in Vanier Park is open until 11 PM on Saturdays. If you’d like to see the stars up close from more than one location, the Trottier Observatory at SFU is also open to public a few nights throughout the year. Be sure to check their schedule as the dates change. You won’t regret making the trip to Abbostford to visit McDonald Dark Sky Park, one of the only parks in BC that has absolutely no light pollution! Mountains on the riverbank circle the area, giving spectators the chance to see stars at their brightest. Don’t just take our word for it, the park is used by the Fraser Valley Astronomers Society, who organize stargazing events in the area. From sunset to moonrise, Whytecliffe Park in West Vancouver is an unbeatable spot for watching the world go by. Stop in at any of the restaurants in Horshoe Bay for a bite, and wander up to a lookout point from there. 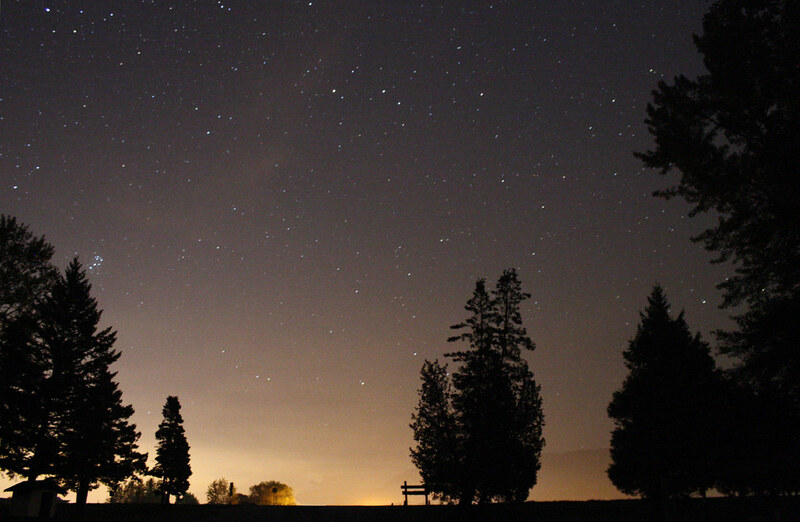 Even if you don’t catch that many stars, you’ll enjoy the stunning view of Bowen Island and the city as night falls. It’s been a week of the colours of a setting sun. ??⭐️?? One of our top choices for stargazing, Porteau Cove is located about halfway between Vancouver and Squamish. Relax and enjoy a dazzling, uninterrupted view of the night sky. Unlike most lookouts in this area, you can get to a great lookout without an intense six hour hike first. Porteau Cove is far enough out of the city to avoid the worst light pollution. Travel there on a clear night and prepare to be amazed! A short drive from Vancouver into Tsawassen, Boundary Bay Provincial Park is nestled in the middle of farm land. It’s miles away from the bright city lights. There are beaches at the park, so pack a twilight picnic and watch the stars come up without any interruption. Drivers take note, the park gates close after dark. Please keep in mind that each area may have rules and restrictions for visiting after dark. Check out more Adventure Safety Tips here.